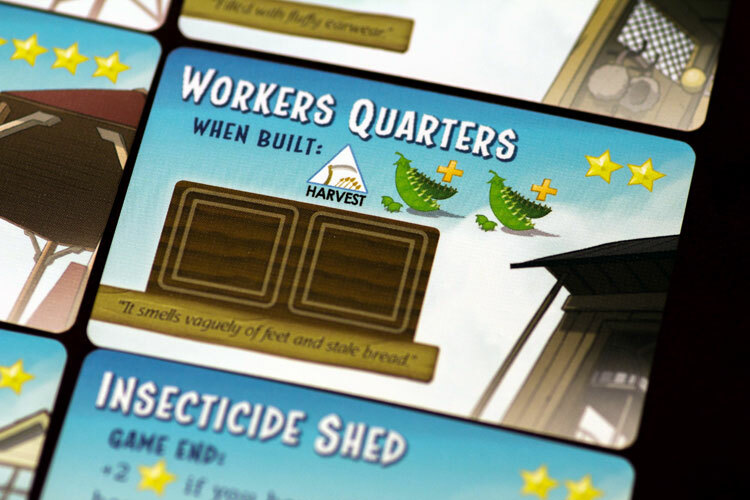 We review Harvest, a worker placement board game published by Tasty Minstrel Games. In Harvest, players are tending a garden in a fantasy world, and must carefully use their actions to earn the most victory points. Maybe you’ve always dreamed of being a farmer but find the idea of growing tomatoes and carrots just way too boring. Welcome to Harvest, where you can take a fantasy-spin on your farming adventure, growing snap peas, rockoli, scarrots, and other very interesting looking veggies. Harvest is a worker placement game for 2-4 players. It playes in about 45 minutes and plays well at all player counts. Buildings can be purchased to give you a unique ability. Harvested crops are also one of the currencies in Harvest. Buying buildings, more expensive seeds, and elixirs require that you spend some of the crops you’ve previously harvested. The main town board is divided into three sections, each with different available actions. The first two farmers in each section can take any two different actions. Any farmer after that only gets to take a single action. The labor market allows you to plant, tend, and harvest crops. The general store lets you acquire goods and seeds that you may need. The land office allows you to expand your farm, plow a new field, or build an available building. The game is played over five rounds. At the beginning of each round, you pick an initiative card that will give you some bonus goods and/or actions and also dictate the turn order for the coming round. In general, the higher numbers give you the best bonuses but will mean you are going later in the round. After five rounds, players count their points from all seeds, crops, and buildings they have and the farmer with the most is the winner. Each player has two farmers they can place each round. 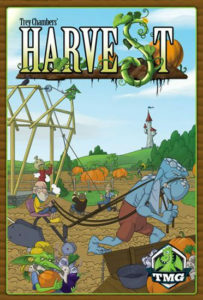 Throughout a game of Harvest, you are limited to 10 actions throughout the entirety of the game. 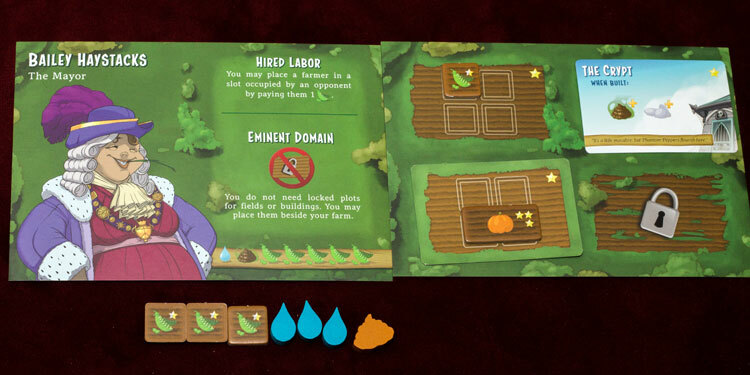 Nearly every action available to you will result in scoring additional points—you’ll acquire seeds, or turn seeds into crops, or purchase a building with additional game end scoring. Obviously, the key is to maximize your scoring opportunities, but because every option seems pretty good, it makes the game feel pretty light and breezy initially. 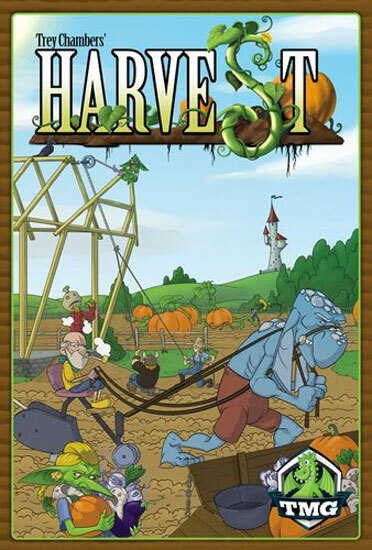 That level of accessibility is great, Harvest seems like an ideal introduction to worker placement games. That said, there is plenty to dig into once you’ve got the basics down. Each round there are random action cards revealed—one per player. These give additional spaces for workers to be placed and open up many new options. Because of changing actions—and the bonuses you may get from your initiative card—it is incredibly difficult to plan very far ahead. 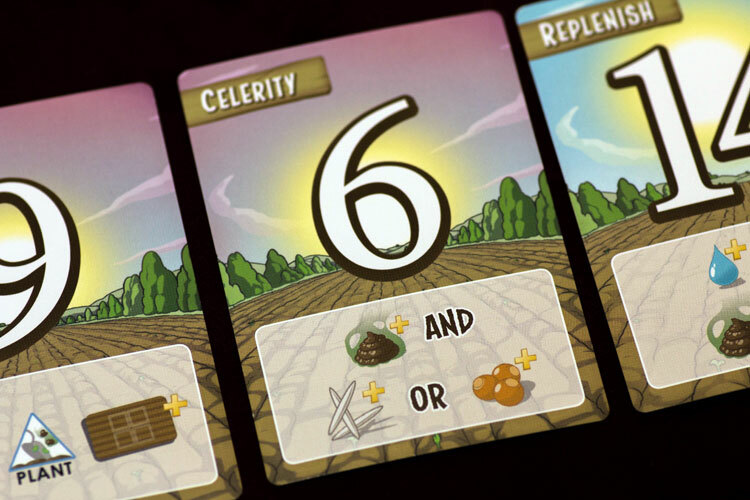 The initiative cards set the turn order and give you bonus actions or resources. The initiative system is a unique twist, it’s simple yet functions perfectly. When choosing the initiative card you want, you have to balance the awesome bonuses of the higher initiative cards with the downside of possibly going last. And the initiative card you choose is immediately replaced before the next person chooses, so everyone is working with imperfect information. You can certainly have an idea of the strategy you want to accomplish but must remain flexible enough to call and audible when something better presents itself. Harvest is more an exercise in tactics than you would expect from a 30-45 minute worker placement game. It is certainly up to you whether this is a positive or not. The start of each round can be a bit slow as players try to digest all of the new actions and initiative bonuses that are available. If you like setting a plan and just executing, Harvest isn’t for you. Having so many unique characters with interesting special abilities adds variety to multiple plays. Each will give you a different direction to at least start. You also won’t use all of the action cards each game so the combinations of characters and actions that become available are virtually endless. There are a few questionable design decisions with the components though. The snap peas count as both seeds and crops so the star on them is half silver and half gold. But it’s nearly impossible to see and looks pretty weird. The phantom pepper and scarrot seeds also look similar. Considering you are tending to your fantasy garden they could have picked any other color for one of those to make it easier to tell apart on the tabletop. There are nine unique characters each with a special power. Harvest is quite a lot of game in a small box. It distills worker placement to its required elements but still leaves enough meat on it to feel interesting and different. There aren’t many rules overhead—the entire rulebook is on one large two-sided piece of paper. Simple concepts executed well. The graphic design missteps are annoying but not crippling. 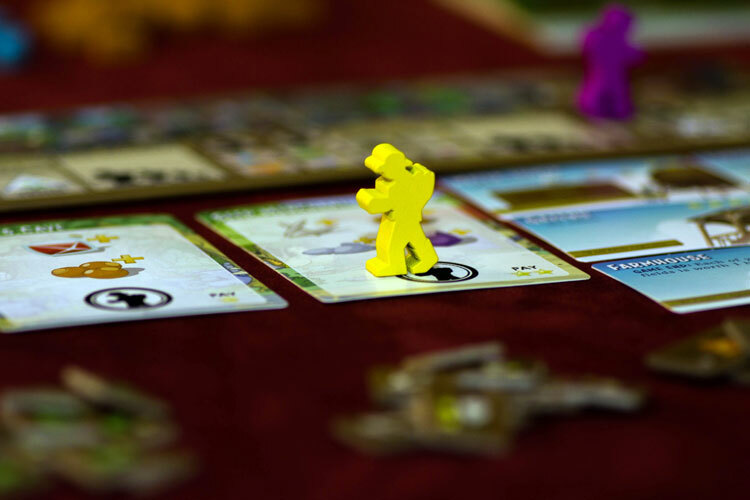 If you are looking for a worker placement game to either introduce others to the genre or just one that plays in under an hour, you certainly should take a close look at Harvest. Final Score: 4 Stars – A lot of depth in a pretty small, quick playing package hampered by a few weird graphic design choices. • Lots of interesting decisions to make in a 45-minute game. • Tons of variety in action cards and player powers. • Graphic design could have used a couple changes. • Lots of information to digest at the start of each round.